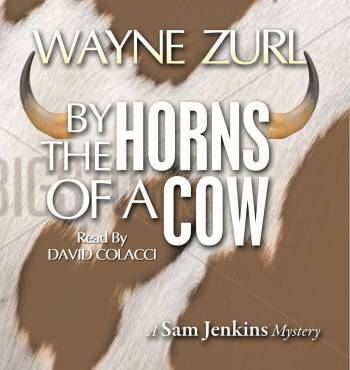 When a fourteen foot tall statue of a dairy cow is stolen from a market in Prospect, Tennessee, Chief Sam Jenkins wonders: Cattle rustlers or ancient Greeks looking for a substitute for their aging Trojan horse? After his TV reporter friend broadcasts a request for information, Jenkins receives snide remarks and laughs from other cops and the public. But soon a serious informant calls with a tip—for a price. During the investigation, Sam meets a beautiful aviatrix, Amelia Goodhardt, who helps him find the cow and arrest two colorful bandits. Visit the home page at www.mindwingsaudio.com for links to all vendors. CDs are available directly from Mind Wings. Also available: Various MP3 audio downloads and eBooks by Amazon, Barnes & Nobel, Sony, Apple, and others. Somewhere in my town, someone was dragging a really big cow behind his pick-up truck. That didn’t make me happy. “How the hell can someone steal a fourteen-foot, brown and white cow and not be seen?” I asked. “Yep, that’s about it,” he said. “And now we’ve got to find it.” I really didn’t sound happy. I nodded and scratched my head, not having a clue why I should care. “It must be pretty hard to hide a fourteen-foot cow,” I said. Stan gave me Sanjev Patel’s address. Patel owned and operated the Git-N-Go market and gas station in Prospect, Tennessee. With the nearest super-market twelve miles away in Maryville, Patel’s store became the place most everyone in town shopped for their small grocery orders. You wouldn’t have to know much about East Tennessee to infer that Sanjev Patel wasn’t a native of Southern Appalachia. Originally, he came from Madras, India. I’m not a Tennessee native either. I’m from New York. Stan Rose – he’s from Los Angeles. Stanley and I share one thing in common; we’re cops for the City of Prospect. I’m the chief and he’s the road sergeant on the four-to-midnight shift. At 11:45 on a Tuesday night – three quarters of an hour after Patel closed his store, we stood in the Git-N-Go parking lot staring at the empty spot where the big cow once stood. Twenty minutes earlier, Stanley called me about the larceny of that fourteen-foot-tall, trailer-mounted mascot from Richfield Dairies of Philadelphia, Tennessee. I felt tired. Most middle-aged men are tired at 11:45 PM after they’ve worked a full day. I felt a little extra drowsy that night because for dinner my wife Kate and I made a crab-meat casserole with chopped artichoke hearts and fresh mushrooms in a Parmesan white-sauce with sherry. And we drank a bottle of Sauvignon Blanc with it. For dessert I sipped one of my St. Patrick’s Day favorites, Bailey’s Irish Cream and vodka on the rocks. More in the mood to snuggle up with my good-looking wife then play detective and find an oversized cow, I had less than a positive attitude. But that night Prospect paid me to locate the mammoth bovine. I played detective. After a few minutes of questioning, I learned neither Mr. Patel nor his twenty-year-old son, Narang, a full-time college student who worked in the store after classes, could offer any leads. Neither saw anyone hanging around the store or the cow before closing. During the days prior to the theft, no one noticed a customer with an abnormal fondness for king-sized cows. In short, I got bupkis from the proprietors. Actually, I got much more than bupkis. Mrs. Patel made chicken korma for dinner and warmed up the leftovers for me. With a piece of Nan bread, mango pickle, and a cup of spiced tea, I enjoyed a great midnight snack.